More of a project than a finished product he has such great athleticism for a seven footer that he is one of the top prospects to be an NBA center. He looks to be a mid 1st round pick but could slip if more polished underclassmen centers enter the draft. If the Lakers can wait for him to develop he could be a good choice, though it is questionable he will develop the outside shooting ability to play power forward. 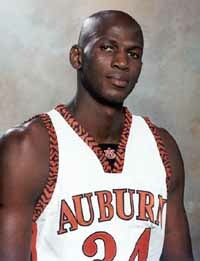 Mamadou N'diaye is a senior at Auburn and has the size and athleticism to play center in the NBA. Not yet a good scorer he still averages 8.9 point per game on 53% shooting. He is a very good rebounder averaging 8 per game. He is still learning the game but runs the floor extremely well for a big man, and, is an extremely good shot blocker. He is a native of Senegal and did not play basketball until he came to prep school in the United States. He got off to a slow start at Auburn but has steadily improved every year. He has been a wonderful student of the game and has learned quickly. He is dedicated and has attend Big man camps during the summers. He has also improved his athleticism and strength, now at 245 ponds he is big enough to play center in the NBA. His most outstanding talent is his ability to run and jump like a guard with incredible lateral quickness. He has great body control and uses it well to hold off defenders. All this adds up to the ability to score easily in the paint, though he has sometimes not been aggressive enough and will settle for a fade-away rather than finish hard. He still needs to work on his post moves and lacks range on his jumper, but has shown good shot selection and he continues to improve. He is a first rate shot blocker and he broke Charles Barkley's career record in his junior year. In addition to his 1.8 blocks per game he alters numerous others. He is a real force in the paint and anchors Auburn's defense. He rebounds almost as well as he blocks averaging 8 per game. His long reach and athleticism really make him a monster at times on the boards. He is not a good one-on-one defender as he is still learning the moves and he has a habit of committing bad fouls. He is still learning the little things that make a basketball player. But he has great potential and his childhood of playing football (soccer to you Americans) shows in his great athletic ability. He played on the Senegal National Team and has dedicated himself to becoming an NBA player. He is expected to play in the Desert Classic, the biggest of the three pre-draft camps. Though he is a project he is still expected to be a mid 1st round pick. He might fall if a few underclassmen with more polished games declare. His averages per game are 26.3 minutes, 8.9 points, 8 rebounds, 0.8 steals, 1.8 block, 0.5 assists, 2.2 turnovers, 3.1 fouls, makes 2.9 of 5.5 field goals (53%) and 3.1 of 4.6 free throws (67%).